It is a very important church in this territory. Well, maybe: for sure it is really beautiful. It has been made all in travertine stone, an elegant local stone. It stands all alone in the middle of a field, the hills beside; it seems it is waiting you though it turns the back on you as if it won't show that it is waiting right you. My friend explained me that Saint Antimo got the deambulatorio, which should be that space around the altar where the pilgrims could go in, make a round and get out. I thought that one entered in a church to stay inside and pray, but he said that the deambulatorio was something typical of those churches, which were very important for the pilgrims. 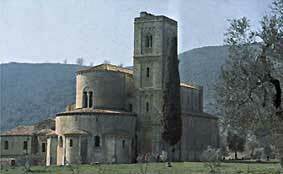 Today many go there to listen the sacred music and the Mass singed by the priests in Gregorian chant. And when each one goes back home and the church remains empty and silent, always on the back, it seems to me as if the church was sad of it, missing all that coming and going.